While there’s no business like show business, the entertainment industry— despite its many quirks—must evolve like any other. This remains apparent in the field of live theater, as performance venues continue to incorporate an increasing amount of technology in the interest of drawing a crowd. For large-scale productions, the budgets have grown, observes John Monitto, director of technical supportat Meyer Sound Labs. He cites the Las Vegas-based Cirque du Soleilproductions, as well as The Beatles’ LOVE at The Mirage as examples. “The sound is the most important creative element in this (latter) production, and the budget reflects this priority,” he noted. For large-scale productions like the Las Vegas-based Cirque du Soleil production of The Beatles’ LOVE at The Mirage, budgets have grown. Sound is often the most important creative element in such a show, and the budget reflects that priority. This doesn’t necessary mean, however, that all new spaces are as elaborate as what was being constructed several years ago. Ben Bausher, consultant in the audio and video systems group at JaffeHolden in Norwalk, CT, observes that from his vantage point, today’s economical climate doesn’t allow for the construction of $300 million megaprojects, such as the Kimmel Center or the Orange County Performing Arts Center. “Now, it’s the $20 to $40 million projects that are being built,” he said. Monitto points out that systems contracting firms that are experienced delivering fast-track installations focus on preparation back at the shop. “The fast pace of the Broadway world can create very tight schedules, so a lot depends upon preparedness and the contractor’s ability to effectively manage a project from start to finish,” he observed.The good news is that amount of technology going into theaters is on the rise—most notably because the theater-going public want to see shows with a lot of tech. When the San Francisco Opera created its Koret-Taube Media Suite, the first high-definition video production facility of any opera house in America, nine Fujinon HD lenses were chosen for the configuration. With the debut of a new program offered by the San Francisco Opera called OperaVision, tighter shots were necessary. OperaVision allows audience members seated in balcony seats an improved view of the stage through closeup and mid-range ensemble shots in highdefinition video on two retractable screens hung from the ceiling. 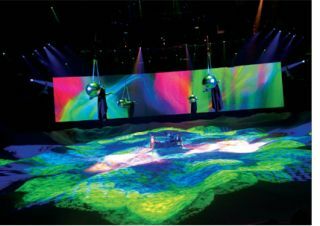 “That’s what brings people to theaters,” Bausher said, pointing to the integration of digital consoles and highdefinition video into performing arts venues. “Theater designers, owners, and show producers need to keep coming up with new reasons for people to go out and see live theater.” With ticket prices so high, producers must give consumers a reason to make the investment, and one of the best ways is to incorporate cutting-edge technology into their shows.